Free Download: How Lean is Lean? 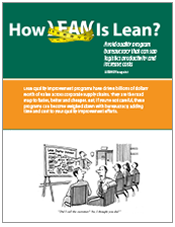 Lean quality improvement programs have driven billions of dollars worth of value across corporate supply chains. But, if you're not careful, these programs can become weighed down with bureaucracy, adding time and cost to your quality improvement efforts.